This is a translation of Chapter 2 - HISTOIRE DE Notre-Dame des Sept-Douleurs DE GRENVILLE, P. Q., by Abbé Michel Chamberland, published by Imprimerie de Sourds-Muet, Montreal, Qc, 1931. Foreword: In 1815, Monseigneur Joseph Octave Plessis, bishop of Quebec, directed the Sulpician priests in the Lake of Two Mountains district, which included in the Seigneury of Petite Nation. From there the missionaries had to fan out throughout the Ottawa River valley in search of souls, the majority of which had not reaped the benefits of religion for many years. 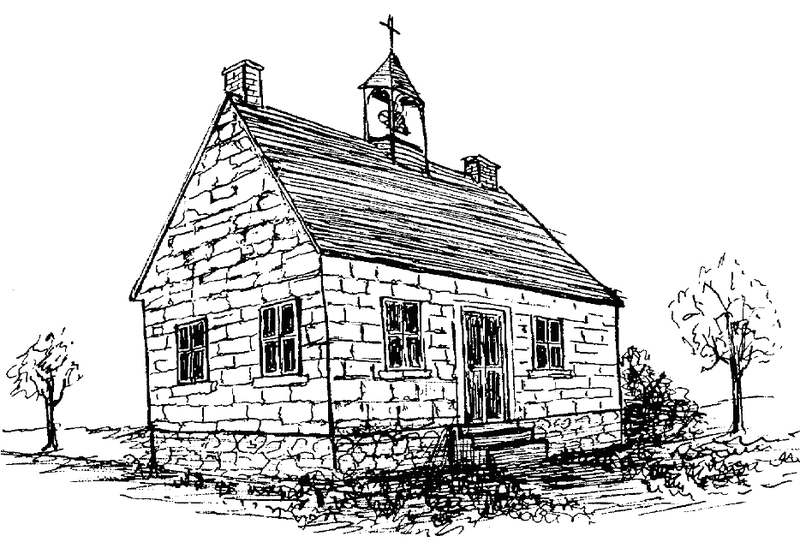 As for the faithful in the surrounding townships of Grenville, Chatham, Longeuil, Alfred and Plantagenet, they had to travel to Petite Nation, to attend mass and receive the sacraments. It was Jean-Batiste Roupe, dit Linsbourg, born in Montreal on January 9, 1782, (whose family was originally from the township of Berne, Switzerland), and ordained priest in 1805 who, for thirteen years had explored, organized and evangelized the Petite Nation Seigneury and surroundings, always with persistent zeal and saintly reputation. In 1827, the Catholic citizens of Petite Nation, aware of the imminent departure of Mr. Roupe, thought it time to request a resident priest, including provision for his support, assumed to come, in part, from the Catholics of Grenville and Chatham, whom had already contributed substantially to this end. In a meeting, Denis-Benjamin Papineau, son of the Seigneur Joseph Papineau, was actioned to appeal to the generosity of the latter, with the understanding that they would have regular visits, whereby the benefits of religion would be shared among the faithful who assembled at these religious services. There was at that time, in the Township of Grenville, a broadminded Protestant Scott named Archie McMillan, generally called “the old Abbot”. His house, built of red pine logs with peeling bark, was referred to as the Old Abbey, likely because of its isolation and the eccentricity of its owner. His nearest neighbours in 1810, the year of his arrival in Grenville, were Mr. Joseph Papineau, notary and seigneur of Petite Nation, and Mr. Alexander Cameron of the Township of Chatham. Between those two neighbours, 5 miles to the east and 18 miles to the west, there were no roads, not even a beaten trail. Contact was by water and with great difficulty, because small craft and rafts had to be drawn along the Long Sault Rapids by rope, and often their cargoes got swamped and carried away by the torrent. In 1812, this hardy pioneer was given the rank of major in the Argenteuil militia, and his battalion was on its way to join the soldiers of Salaberry, when they learned, at Pointe St Charles, of the victory at Chateauguay and of the enemy flight. Mr. McMillan was also the first post-master (1819-1829), a position he held until his death. Being concurrently justice of the peace, he was always conscious of the need to settle peacefully, disputes which frequently flared up among canal workers. Your esteemed letter arrived during my absence in Montreal. On my return I hastened to reveal its contents to the Catholics of Grenville and Chatham, in an assembly last Sunday at the home of Edwin Pridham. I found them unanimous in their desire to join their brothers of the Petite Nation in supporting a pastor. I can state with confidence that we will pay twenty to thirty louis annually, and more in the near future, with the colony’s rapid development, which will be further accelerated by the establishment of a holy parish. There are 28 Catholic families in Grenville, and about 14 families in Chatham and Lachute, that which comprises two hundred souls, assuming an average of five souls per family. Add to that those working on the canal, whom are mostly Catholics. The most central location, here, for preaching mass is what we today call the “Camping Ground”, in Range 1, near the military canal, which is a tract of crown land. If the government refuses, as I am proprietor of the surrounding land, I will volunteer space required for the said purpose of building a chapel. I take liberty here to suggest a means of arriving at a practical solution: that it be notarized in writing that a priest, duly assigned by the bishop, will deliver regular masses here, beyond a specified future date. A schoolhouse built just this year, could initially serve as a chapel, because there are already benches, a stove and other furnishings. Let me finish with my assurance of support in cooperating with the work you have undertaken, to put an end to the lack of Christianity characteristic of our region. Crimes and misdemeanors of all sorts are perpetrated daily, in large part due to the public works underway, particularly the canal building. The arrival of a priest is greatly anticipated. Better believe it! That letter is important, because it outlines the first Catholic mission in the Township of Grenville. It is admirable that two sincere and influential Protestants, McMillan and Pridham, would become actively involved in welcoming a priest among them, in the interest of establishing moral order. But it is not particularly surprising because these men, experienced leaders, already held the respect and admiration of all their citizens, Catholic and Protestant alike. Even today the spirit of these two men lives on through their descendants, whose integrity and know-how have not diminished. But we must ask ourselves whether the French Canadians of Grenville went too far in the sacrifice of their own legitimate rights, out of excessive deference to these gentlemen and their successors. Many signs of national shortcomings, with respect to religion, education and municipal government are now apparent, but it remains to determine where the fault lies in all of that. Let us hasten to add that this excessive patriotism no longer exists among the French Canadians of Grenville today, and any remaining vestiges will soon have completely disappeared. In Grenville township were: Jean Green, Baptiste Quesnel, Pierre Groslot, Théodore Sabourin, Augustin Brénéqui, Joseph Lanthier, Pierre Montpetit dit Potvin, François Leblond, Augustin-Jean Robillard, Louis-Joseph Robillard, Louis-Joseph Sarrazin, Gédéon Walsh, John J. Buttler, John Burns, Guillaume Brophy, Baptiste Leblond, Louis-Joseph Bean, Joseph Ménard, Jean-Louis Groulx, Joseph Rhulé dit Désabrais, Joseph Maillé, Louis Sarrazin, Joseph Dupuis, Joseph Caillé, Iréné Troqué, Michel Pilon, Gabriel Barbeau, and Dan. Williams. The latter, Capitan Dan Williams, was employed on the canal but taught school after work. Five of his children were born in Grenville. He left the area in 1832, and died in East Templeton, in 1869. In Chatham township were: Isaac Lapierre, Frs-Jos. Bourgeois, Elie Rochon, Michel Caillé, Antoine Sureau dit Blondin, Hughes McMullan, John MeGhoerty, Hughes Cameron, Allan Cameron, Bernard MacMahon, Archibald McPhee, Robert Garland, James McGee, and Ed. Brackan. The French settlers came mostly from Rigaud, Vaudreuil and Terrebonne. All were farmers. These folks were poor, but peaceful. There were also numerous tradesmen. But these laborers, who mostly worked on the military canal, never stayed for long. The transients left behind more scandals than money, except in the bars and taverns, which numbered more than a half dozen. While waiting for water to flow in the canal, they immersed themselves in whiskey. This type of Turkish bath made their heads swim. Libation so stimulated the senses that bloody fights often broke out. 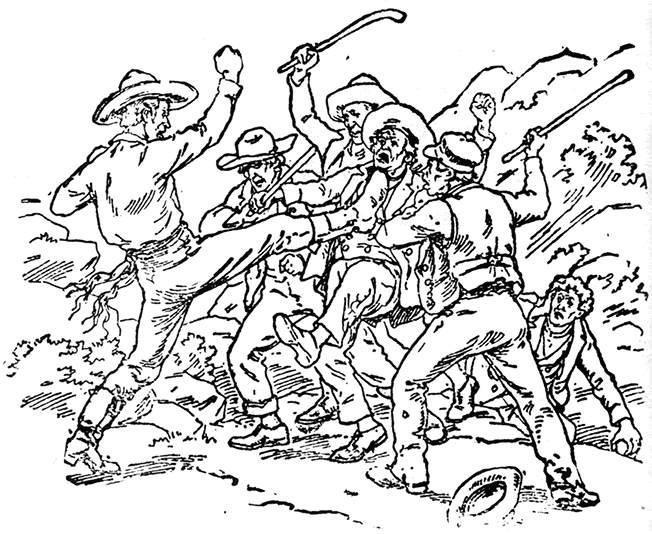 In such cases the conflict typically reverted to Bully’s Acre. This location became famous for the terrifying exploits of the likes of Joseph Montferrand (a.k.a. Big Joe Mufferaw) and Castor Renaud, et cetera. These strong-armed French Canadian champions had as mission knocking senseless as many Orangemen and English as possible, and the Grenville arena (Bully’s Acre) was the designated spot where many of these epic battles took place.